Could always use them in the fogs (H11 too) if the pattern spread is no good or what. Both the ballast and bulb were found to be working. My dad had just assumed the HID bulb had died and took it out rather than check the connections. While doing that he cracked the ceramic insulator, but it seems to work just fine. I'm always trying to implement new technology on my vehicles when something breaks, and my dad is always rushing out to buy the old part at full price before I get a chance to try it my way (bought 2 Pb batteries for the truck before I could put in my supercap, bought halogen bulbs before I could diagnose HID, bought a Pb battery for the Acura before I could experiment with a LiFePO4). 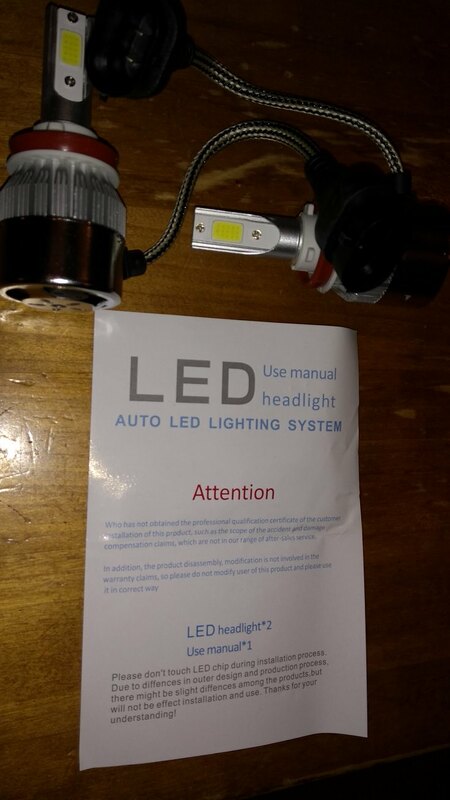 Anyhow, I bought H11 LED bulbs from Amazon, and the light output was just slightly less than my HID, but the real problem was the mounting tabs were impossibly fragile and all broke off immediately. Also, the beam pattern in the projector lens was unacceptable. I sent them back. That said, I tried the same LED bulbs in H7 formfactor for my motorcycle in a reflector housing, and the beam pattern is good and light output much better than halogen. I ripped out the HID kit on the bike and will try the LEDs out. The best part, power consumption is much less than advertised. I measured 15 watts, and they are rated to draw 25 watts each. That's 1/3rd of the power consumed by the old HIDs. I wanted a passive cooled LED since fans are susceptible to failure, and I don't want the noise on my motorcycle. As for the HID power consumption, I suspect the HIDs truly consume only 35 Watts. At 47 Watt total, the ballasts would be 75% efficient, which is lowish for DC-DC converters, but ballasts are a special case anyway. I never considered this though. I might try out LEDs for the hell of it, but I need the fanless copper braid type as the bulky fan types are impossible to mount. I read the braid isn't always electrically insulated, so I'd put them in a net to prevent them touching metal. Last edited by RedDevil; 05-29-2018 at 04:37 AM.. I might try out LEDs for the hell of it, but I need the fanless copper braid type as the bulky fan types are impossible to mount. Let me know how that type works out. You might just test the braids to see if they are electrically connected or not, because I would promote airflow to them as much as possible, including not using a net. These suckers get hot. The heatsink on the one I purchased is untouchable after a couple minutes use. I should get a temp reading to see what it gets up to. I think LEDs are the way of the future, though there are drawbacks still. I've been running a DDM tuning kit in my Insight for several years now. Recently I was curious about LEDs and purchased an H1 kit to stick in my H1 projectors. Turns out the LED "bulbs" are too big around and don't fit into the projectors. When I have an actual failure, I might look for the smallest diameter LED bulbs and drill out the projectors a bit to make them fit, but until then I'm sticking with my 35w HIDs. Good to know about the low efficiency of the ballasts, that's something I've wondered. Light output is significantly better though, so I'm not complaining. The reason electrical consumption is of concern to me is that I run a supercap only in my motorcycle. Headlights rapidly deplete my 400f caps connected in series, leaving me with about 10 seconds to start the bike from switching it on. The lower power consumption of the LEDs will double my starting opportunity. I wasn't tempted enough by then. But that was way back when those lamps were still, you know, EXPENSIVE...! Special offer, it was less than €9 including shipping...! Surely that cheap can't be any good, but worst case I would still have had a story to tell. I tested them. They draw less than 0.8 A so less than 10 Watt. You can barely hear the fans. They get lukewarm and the heat spreads quickly down to the fins and fan. I doubt the fan is even necessary. Logically, the light yield isn't great (comparable to a 55 Watt halogen lamp, but neutral white) nor confined enough to be of use as a headlight. They do fit, easily even, but are nowhere near as bright as the HIDs - nor as neatly cut off. 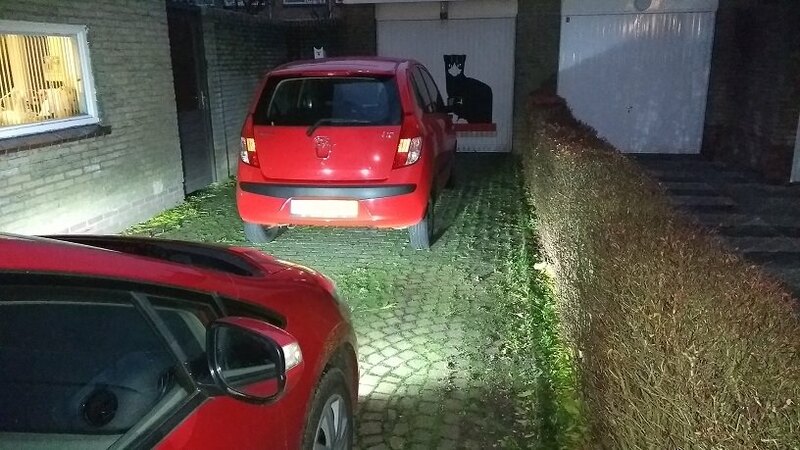 The stray light did not seem to be a blinding problem in the projectors, but still it is worse than the HIDs even though the HIDs are at least 5 times brighter within their beam. So a no go. Worse than halogens (more stray light) and worse than HIDs (nowhere near as bright). Fair enough, I did not expect anything else for the money. Now my kids Scouting group resides on a fortress island surrounded by a serrated moat, and access is by a narrow one-way road adjacent to that moat. At night unlit bikers and pedestrians travel it and can't be seen round the corners, as the low beams are relatively narrow. DRLs with a spread to the side would be ideal. And the fogs do spread wide. 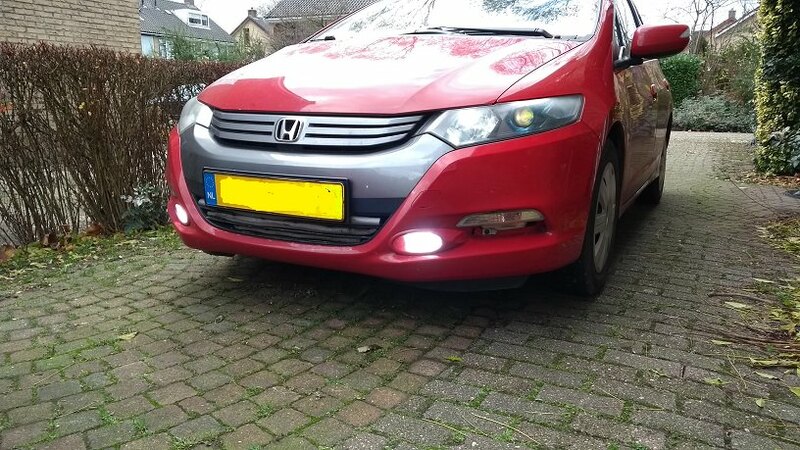 So I wanted to use the fogs as DRLs, but the OEM halogens in them are too bright for that. I tried some cheapo LED replacements, but they were blueish, not bright enough and rapidly failing. A second pair of different LEDs were better, but in the end they too failed. These LEDs however are twice as bright as the last attempt. As DRLs they are on a par with the brighter of the OEM LED DRLs around here. By day they are very noticeable but won't blind anyone. By night they may be on edge, but I'd only switch them on when I need to then. As you can see they do have a low and wide spread. This will definitely help me safely round the moat. Last edited by RedDevil; 12-08-2018 at 07:00 PM..
As I read the thread, I was going to mention the issue of the light spread with LEDs, but it appears you've already discovered it. My best guess - since I haven't tried it - is that you want to try LEDs that are aligned like your OE bulb is. If your filament runs side to side, the LEDs should too, and if your filament runs front to back, your LEDs should too. Otherwise I doubt it will throw the light anywhere near close to the direction the reflectors are designed to work with. Again, I haven't tried it yet, but it seems logical that these flat & wide LEDs have little chance of throwing the light in the correct direction(s). Especially when it comes to high/low beams, which are on separate filaments with slightly different locations within a bulb, allowing for a tighter or a wider beam depending in which is active. These cheapo bulbs would probably be fine for a car that never leaves the city or otherwise never needs the high beams, and will definitely cut back on power consumption. Plus it will take a long time for the efficiency to repay $100 if its only saving you a few cents per tank of gas...mostly of benefit to people going alternatorless to increase run-time between charges. These LEDs are not suited for use in headlight units, just as I expected. The 'filament' is too large to allow for sharply defined beams. They are marginally usable as fog lights, depending on the fog light housing. Their light output just isn't enough to justify their use as fog lights. They are fit to use as DRLs in most fog light housings. Which was what I was looking for. If these don't fail prematurely I'm very happy indeed. Last edited by RedDevil; 12-10-2018 at 04:43 AM.. They are too bright to use (in the fog lights) when dark. When I flip them on I see everything light up. Easily 10 times more stray light than my low beams at eye height. Still, that's nowhere near what my high beams do. They are perfect in between. A nuisance to other road users at worst, like when it is dark, but not really blinding. Someone out there is able to fabricate H11 LED lamps that do put out as much light as a 55 Watt halogen bulb for just € 6.04 a pair - cheaper than many halogens. Last edited by RedDevil; 12-10-2018 at 03:04 AM..